The term "Calvinism" is loosely used by some people who do not hold Calvin's teaching on predestination and do not understand exactly what Calvin taught. "The Calvinistic system especially emphasizes five distinct doctrines. These are technically known as "The Five Points of Calvinism". And they are the main pillars upon which the superstructure rests." "The five points may be more easily remembered if they are associated with the word T-U-L-I-P , T, Total Inability; U, Unconditional Election; L, Limited Atonement; I, Irresistible (efficacious) Grace; and P, Perseverance of the Saints." These are the points of Calvinism. I have heard preachers say, "I am a one-point Calvinist." I have heard others say, "I am a two- or three-point Calvinist." I want us to look at all five points of Calvinism as taught by John Calvin, then see what the Bible has to say on each point. The Bible teaches total depravity, and I believe in total depravity. But that simply means that there is nothing good in man to earn or deserve salvation. The Bible says in Jeremiah 17:9, "The heart is deceitful above all things, and desperately wicked." A preacher brought a wonderful sermon on the depravity of the human heart. And when he finished his message, someone came to him and said," I want you to know I can't swallow that depraved heart that you preached about." The preacher smiled and said, "You don't have to swallow it. It's already in you!" Jesus looked over Jerusalem and wept and said, "O Jerusalem, Jerusalem . . .how often would I have gathered thy children together, even as a hen gathereth her chickens under her wings, and ye would not!" (Matt. 23:37). Here again notice, He did not say, "How often would I have gathered you together, but you could not." No. He said, "Ye would not!" It was not a matter of whether they could; it was a matter of whether they would. Revelation 22:17, the last invitation in the Bible, says, "And the Spirit and the bride say, Come. And let him that heareth say, Come. And let him that is athirst come. And whosoever will, let him take the water of life freely ." D. L. Moody addressed a large group of sceptics. He said ,"I want to talk about the word believe, the word receive, and the word take." When Mr. Moody had finished his sermon, he asked, "Now who will come and take Christ as Saviour?" One man stood and said, "I can't." Mr. Moody wept and said, "Don't say, 'I can't.' Say, 'I won't!'" And the man said, "Then, I won't!" But another man said, "I will!" Then another said, "I will!" And another said , "I will!" Until scores came to trust Christ as Saviour. Some Calvinists use John 6:44 in an effort to prove total inability. Here the Bible says, "No man can come to me except the Father which hath sent me draw him...."But the Bible makes it plain in John 12:32 that Christ will draw all men unto Himself. Here the Bible says, "And I, if I be lifted up from the earth, will draw all men unto me." All men are drawn to Christ, but not all men will trust Christ as Saviour. Every man will make his own decision to trust Christ or to reject Him. The Bible makes it clear that all men have light. John 1:9 says, "That was the true Light, which lighteth every man that cometh into the world." Romans 1:19,20 indicates that every sinner has been called through the creation about him. And Romans 2:11-16 indicates that sinners are called through their conscience, even when they have not heard the Word of God. So in the final analysis, men go to Hell, not because of their inability to come to Christ, but because they will not come to Christ-"Ye will not come to me, that ye might have life." The teaching that men, women and children are totally unable to come to Christ and trust Him as Saviour is not a scriptural doctrine. The language itself is not scriptural. "....Not all men are created with similar destiny but eternal life is foreordained for some , and eternal damnation for others. Every man, therefore, being created for one or the other of these ends, we say, he is predestined either to life or to death." There is the Bible doctrine of God's foreknowledge, predestination and election. Most knowledgeable Christians agree that God has His controlling hand on the affairs of men. They agree that according to the Bible, He selects individuals like Abraham, Isaac, Jacob, and David as instruments to do certain things He has planned. Most Christians agree that God may choose a nation-particularly that He did choose Israel, through which He gave the law, the prophets, and eventually through whom the Saviour Himself would come- and that there is a Bible doctrine that God foreknows all things. I have often said, "Did it ever occur to you that nothing ever occurred to God?". God in His foreknowledge knows who will trust Jesus Christ as Saviour, and He has predestined to see that they are justified and glorified. He will keep all those who trust Him and see that they are glorified. But the doctrine that God elected some men to Hell, that they were born to be damned by God's own choice, is a radical heresy not taught anywhere in the Bible. The verse says nothing about being chosen for Heaven or Hell. It says we are chosen to go and bring forth fruit, which simply means that every Christian is chosen to be a soul winner. The fruit of a Christian is other Christians. Proverbs 11:30 says, "The fruit of the righteous is a tree of life; and he that winneth souls is wise." Nowhere does the Bible teach that God wills for some to go to Heaven and wills others to go to Hell. No. The Bible teaches that God would have all men to be saved. Second Peter 3:9 says that He is "not willing that any should perish, but that all should come to repentance." First Timothy 2:4 says, "Who will have all men to be saved, and to come unto the knowledge of the truth." Does God really predestinate some people to be saved and predestinate others to go to Hell, so that they have no free choice? Absolutely not! Nobody is predestined to be saved, except as he chooses of his own free will to come to Christ and trust Him for salvation. And no one is predestined to go to Hell, except as he chooses of his own free will to reject Christ and refuses to trust Him as Saviour. John 3:36 says, "He that believeth on the Son hath everlasting life: and he that believeth not the Son shall not see life; but the wrath of God abideth on him." Nothing could be plainer. The man who goes to Heaven goes because he comes to Jesus Christ and trusts Him as Saviour. And the man who goes to Hell does so because he refuses to come to Jesus Christ and will not trust Him as Saviour. By limited atonement, Calvin meant that Christ died only for the elect, for those He planned and ordained to go to Heaven: He did not die for those He planned and ordained to go to Hell. Again I say, such language is not in the Bible , and the doctrine wholly contradicts many, many plain Scriptures. For instance, the Bible says in I John 2:2, "He is the propitiation for our sins: and not for our's only, but also for the sins of the whole world ." The teaching of Calvinism on Limited Atonement contradicts the express statement of Scripture. First Timothy 2:5,6 says, " The man Christ Jesus; Who gave himself a ransom for all...."
The Bible teaches that Jesus is the Saviour of the world. John 4:42 says, "And said unto the woman, Now we believe , not because of thy saying: for we have heard him ourselves, and know that this is indeed the Christ, the Saviour of the world." Again I John 4:14, "And we have seen and do testify that the Father sent the Son to be the Saviour of the world." The Scriptures make it plain that Jesus came to save the world. John 3:17 says, " For God sent not his Son into the world to condemn the world; but that the world through him might be saved." No man will ever look at Jesus Christ and say, "You didn't want to be my Saviour ." No! No! Jesus wants to be the Saviour of all men. As a matter of fact, I Timothy 4:10 says, "For therefore we both labour and suffer reproach, because we trust in the living God, who is the Saviour of all men, specially of those that believe." The Bible teaches that Christ bore the sins of all people. Isaiah 53:6 says, "All we like sheep have gone astray; we have turned every one to his own way; and the Lord hath laid on him the iniquity of us all." There are twos "alls" in this verse. The first "all" speaks of the universal fact of sin- "All we like sheep have gone astray." And the second "all" speaks of universal atonement-"and the Lord hath laid on him the iniquity of us all." The "all" in the first part of Isaiah 53:6 covers. If all went astray, then the iniquities of all were laid on Christ. Not only did He bear the sins of us all, but the Bible plainly teaches that He died for the whole world.Look at John 2:2: "And he is the propitiation for our sins: and not for ours only, but for the sins of the whole world." If that isn't plain enough, the Bible says His death was for every man; "But we see Jesus, who was made a little lower than the angels for the suffering of death, crowned with glory and honour; that he by the grace of God should taste death for every man" (Heb. 2:9). Nothing could be plainer than the fact that Jesus Christ died for every man. First timothy 2:5,6 says, "For there is one God, and one mediator between God and men, the man Christ Jesus; Who gave himself a ransom for all. . . . " Romans 8:32 states, "He that spared not his own Son, but delivered him up for us all, how shall he not with him also freely give us all things?" John 3:16 has often been called "the heart of the Bible." It has been called "the Bible in miniature." "For God so loved the world, that he gave his only begotten Son, that whosoever believeth in him should not perish, but have everlasting life." Jesus died for the whole world. He suffered Hell for every man who has ever lived or ever will live. And no man will look out of Hell and say, "I wanted to be saved, but Jesus did not die for me." Some argue that if Jesus died for the whole world, the whole world would be saved. No. the death of Jesus Christ on the cross was sufficient for all, but it is efficient only to those who believe. The death of Jesus Christ on the cross made it possible for every man everywhere to be saved. But only those who believe that He died to pay their sin debt and who trust Him completely for salvation will be saved. Again I quote John 3:36, "He that believeth on the Son hath everlasting life. . . ." Everybody is potentially saved, but everybody is not actually saved until he recognises that he is a sinner, believes that Jesus Christ died on the cross to pay the sin debt, and trust Him completely for salvation. The atonement is not limited. it is as universal as sin. Romans 5:20 says, "But where sin abounded, grace did much more abound." Isaiah 53:6 states, "All we like sheep have gone astray; we have turned every one to his own way; and the Lord hath laid on him the iniquity of us all." A famous English preacher spoke in an English town, then rushed to catch his train for London. A sinner who heard him preach felt that he must immediately settle the matter of salvation. So he followed the preacher to the train. Just as the train pulled into the station, he took hold of the preacher's lapel and said, " I want to be saved! Tell me how!" The minister said, "I must catch this last rain to London. Do you have a Bible?" "Yes, I have one at home," said the anxious inquirer. "Then go home and find Isaiah 53:6. Read it carefully. Go in at the first all, and come out at the last all, and you will be saved." The preacher rushed away, and the anxious sinner was left alone. He went back to his home, and opening his Bible, he turned to Isaiah 53:6. What did the preacher mean, he wondered--"Go in at the first all and come out at the last all, and you will be saved"? He found the verse and read it carefully: "All we like sheep have gone astray." Well, he thought to himself, I can certainly go in at the first all. I have gone astray. I am a poor, lost sinner. The he read the last part of the verse, "And the Lord hath laid on him the iniquity of us all." He said to himself, "If I come out at the last all, I must believe that all my sins were laid on Christ, that He took my place and paid for my sins. And if I rely upon that, I will be saved. That's what the preacher meant." He then trusted Christ and was saved. He believed that he was a sinner, and that all his sins had been laid on Christ. The fourth point of Calvinism is irresistible grace. By irresistible grace, John Calvin meant that God simply forces people to be saved. God elected some to be saved, and he let Jesus Christ die for that elect group. And now by irresistible grace, He forces those He elected, and those Jesus Christ died for to be saved. The truth of the matter is, there is no such thing as irresistible grace. Nowhere in the Bible does the word "irresistible" appear before the word "grace". That terminology is simply not in the Bible. It is the philosophy of John Calvin, not a Bible doctrine. The word "irresistible" doesn't even sound right in front of the word "grace." Grace means "God's unmerited favour." Somebody said G-R-A-C-E- God's riches at Christ's expense. Grace is an attitude, not a power. If Calvin had talked about the irresistible drawing power of God, it would have made more sense. But instead, he represents grace as the irresistible act of God compelling a man to be saved who does not want to be saved, so that a man has no choice in the matter at all, except as God forcibly puts a choice in his mind. Calvinism teaches that man has no part in salvation, and cannot possibly co-operate with God in the matter. In no sense of the word and at no stage of the work does salvation depend upon the will or work of man or wait for the determination of his will. Does the Bible say anything about irresistible grace? Absolutely not! The Scriptures show that men do resist and reject God. Proverbs 29:1 states, "He, that being often reproved hardeneth his neck, shall suddenly be destroyed, and that without remedy." Notice the word "often" in this verse. If God only gave one opportunity to be saved, then man could not complain. But here the Bible says, "He, that being often reproved.. . " This means the man was reproved over and over again. Not only was he reproved many times, but he was reproved often. But the Bible says he "hardeneth his neck" and "shall suddenly be destroyed, and that without remedy." That certainly doesn't sound like irresistible grace. The Bible teaches that a man can be reproved over and over again, and that he can harden his neck against God, and as a result will be destroyed without remedy. "Because I have called, and ye refused; I have stretched out my hand, and no man regarded; But ye have set at nought all my counsel, and would none of my reproof: I also will laugh at your calamity; I will mock when your fear cometh." Here the Bible plainly says, "I have called, and ye have refused; I have stretched out my hand, and no man regarded; But ye have set at nought all my counsel, and would none of my reproof." That doesn't sound like irresistible grace. God calls, and men refuse. Is that irresistible? God stretches out his hand and no man regards it? Is that irresistible grace? No. The Bible makes it plain that some men do reject Christ, that they refuse His call. John 5:40 says, "Ye will not come to me, that ye may have life." That verse plainly teaches that men can and do resist God and refuse to come to Him. So here were people; some of whom had seen Jesus and heard Him preach; others who had heard Peter at Pentecost; others who had heard Stephen and other Spirit-filled men preaching with great power. And what had they done? They were stiff-necked and uncircumcised in heart and ears. That is ,they were stubborn and rebellious against God. The Bible plainly says, "They resisted the Holy Ghost." God offers salvation to all men. Titus 1:11 says, "For the grace of God that bringeth salvation hath appeared to all men." But man must make his own choice. He must either receive or reject Christ . John 1:12 says. "But as many as received him , to them gave he power to become the sons of God, even to them that believe on his name." When Jesus wept over Jerusalem, he said, "O Jerusalem, Jerusalem, thou that killest the prophets, and stonest them which are sent unto thee, ho often would I have gathered thy children together, even as a hen gathereth her chickens under her wings, and ye would not!" Here again the Bible clearly indicates that God would have gathered them together as a hen gathers her chickens, but they would not. That certainly shows that they could reject and resist Christ. The Bible teaches, and I believe in, the eternal security of the born-again believer. The man who has trusted Jesus Christ has everlasting life and will never perish. But the eternal security of the believer does not depend on his perseverance. I do not know a single Bible verse that says anything about the saints' persevering, but there are several Bible verses that mention the fact that the saints have been preserved. Perseverance is one thing. Preservation is another. No. The saints do not persevere; they are preserved. The Bible states in Jude 1. "Jude, the servant of Jesus Christ, and brother of James, to them that are sanctified by God the Father, and preserved in Jesus Christ..." First Thessalonians 5:23 says, "And the very God of peace sanctify you wholly: and I pray God your whole spirit and soul, and body be preserved blameless unto the coming of our Lord Jesus Christ." The other morning I opened a jar of peach preserves. I don't know how long those peaches have been in that jar. But the jar had been sealed some time ago, and the peaches were preserved. When I took out the preserves and ate them with a good hot biscuit, they were as good as they were the day they were placed in the jar. But wait a minute! The peaches had nothing to do with it. They were not fresh and good because they had persevered. They were good and fresh because they had been preserved. "To an inheritance incorruptible, and undefiled, and that fadeth not away, reserved in heaven for you, Who are kept by the power of God through faith unto salvation ready to be revealed in the last time." "My sheep hear my voice, and I know them and they follow me: And I give unto them eternal life: and they shall never perish, neither shall any man pluck them out of my hand. My Father, which gave them me, is greater than all, and no man is able to pluck them out of my Fathers hand." Now that doesn't sound like perseverance of the sheep or the saints. Here the sheep are in the Fathers hand, and they are safe-not because they persevere, but because they are in the Fathers hand. Charles Spurgeon once said, "I do not believe in the perseverance of the Saviour." To be sure, the Bible teaches the eternal security of the believer. But the believer's security has nothing to do with his persevering. We are secure because we are kept by God. We are held in the Father's hand. And according to Ephesians 4:30, we have been sealed by the Holy Spirit until the day of redemption. So I disagree with all five points of Calvinism as John Calvin taught it. "(1) Universalism, that all will be saved. (2) Arminianism, which holds that Christ died equally and indiscriminately for every individual......., that saying grace is not necessarily permanent, but that those who are loved of God, ransomed by God, and born of the Holy Spirit may (let God wish and strive ever so much to the contrary) throw away all and perish eternally; and (3) Calvinism." "Only two are held by Christians." That is Calvin's position and Arminius' position." Calvinists would like to make people believe that if one does not teach universal salvation, he must either be a Calvinist or an Arminian. And since the Arminian position does such violence to the grace of God, many preferred to call themselves Calvinists. But a person doesn't have to take either position. I am neither Arminian nor Calvinist. I believe in salvation by grace through faith in the finished work of Christ. I believe in the eternal security of the believer. I believe that Jesus Christ died for all men, and I believe what the Bible says, "That whosoever shall call upon the name of the Lord shall be saved." But I disagree with all five points of Calvinism as John Calvin taught it. In conclusion, let me say that Calvin and those who followed him claimed to believe and follow the Bible. They claimed to find at least a germ of the Calvinist doctrine in the Scriptures. But a careful student will find that again and again they go beyond Scripture, and that Calvinism is a philosophy developed by man and depending on fallible logic and frail, human reasoning, with the perversion of some Scriptures, the misuse of others, and the total ignoring of many clear Scriptures. Calvin did teach many wonderful, true doctrines of the Scripture. It is true that God foreknows everything that will happen in the world. It is true that God definitely ordained and determined some events ahead of time and selected some individuals for His purposes. It is certain that people are saved by grace, and are kept by the power of God. That far Calvinists may well their doctrines by the Scriptures. But beyond that, Calvinism goes into the realm of human philosophy. It is not a Bible doctrine, but a system of human philosophy, especially appealing to the scholarly intellect, the self-sufficient and proud mind. Brilliant, philosophical, scholarly preachers are apt to be misled on this matter more than the humble-hearted, Bible-believing Christian. I have your letter which came recently, objecting to my article, "Why I Disagree With All Five Points of Calvinism." In the second paragraph of page 1, you say, "As to will. . . "Then you spend the next two or three pages talking about will and calling attention to Bible verses. You mention Titus 3:5 where the Bible says, " Not by works of righteousness which we have done, but according to his mercy he saved us, by the washing of regeneration, and renewing of the Holy Ghost." I have just read this section of your letter over several times, and you seem to confuse works with will. For instance, you call attention to Isaiah 64:6 where the Bible says, " all our righteousnesses are as filthy rags. " Trusting Christ for salvation is the opposite of works. When a man believes that Jesus Christ died for him and fully trusts Jesus to save him, and nothing else, then he's not working for salvation. He's trusting Christ and what Christ did at Calvary. But it is his own will that he trusts Christ. God doesn't make anyone trust Him. In John 5:40 Jesus said, "Ye will not come to me, that ye might have life." He did not say you cannot come; He said you will not come. You go on to say in this particular part of your letter, "We are sinners from birth. . . as Adam, we hid ourselves from God." It is true that Adam hid himself from God. But when God came and called for Adam, Adam answered God of his own will and he came out from his place of hiding of his own will. God did not take Adam by the hand and drag him out of the place of hiding. He simply called and Adam came out. Every man comes to God of his own will. In Matthew 23:37 Jesus said, "O Jerusalem, Jerusalem, thou that killest the prophets, and stonest them which are sent unto thee, how often would I have gathered thy children together, even as a hen gathereth her chickens under her wings, and ye would not!" Still discussing the matter of will, you make reference to Romans 5:12 and say that we are dead in sin. Then you continue, "Note a dead person cannot move, respond, walk, nor anything." Now, you have a misunderstanding of death. Death is not annihilation. Death is not cessation of existence. Death is simply separation. Physical death is the separation of the soul and spirit from the body, and spiritual death is the separation of the man from God. In the parable of the prodigal son, when the prodigal returned home the father said, "This my son was dead, and is alive again." The prodigal son was dead in the sense that he was separated from the father. He was certainly capable of making decisions while he was in the far country separated from the father. As a matter of fact, he made the decision and went back to the father. Luke 15:18-20 says, "I will arise and go to my father, and will say unto him, Father, I have sinned against heaven, and before thee. And am no more worthy to be called thy son: make me as one of thy hired servants. And he arose, and came to his father." Now, here is a dead person who could move, respond, walk, see his need, decide to do something about it, and go to the father. And verse 24 says, "For this my son was dead, and is alive again; he was lost, and is found." Your misunderstanding of death has led you to build a false doctrine based on an illustration, instead of Scripture. In Genesis 2:17 God said to Adam, "..for in the day that thou eatest thereof thou shalt surely die." If you'll read the next few chapters of Genesis, you will find that Adam did not die in the sense of ceasing to exist when he partook of the forbidden fruit. As a matter of fact, Genesis 5:4 says, "And the days of Adam after he had begotten Seth were eight hundred years: and he begat sons and daughters." According to this verse, Adam lived eight hundred years after he begat Seth, and Seth was not begotten until after Adam disobeyed God. Now, was God wrong when He said to Adam, "Thou shalt surely die"? No. Well, did Adam die? Yes, He died in the sense that God drove him from His presence, and he was separated from God because of his sins. When the Bible says that men are dead in trespasses and sins, that does not mean they cannot move, respond, walk, nor anything as you said in your letter. Adam did a lot of moving and a lot of responding and a lot of walking in the more than 800 years he lived after the fall. So you see, when the Bible says that "death passed upon all men, for that all have sinned," that "death" is not to be compared with the body of a dead man lying in a casket. I might say that what you see in the casket in the funeral home is really not the man. The body that you're looking at is only the house in which the man lived. The man who lived in that house is still alive. He's either with Christ in Heaven, or he's in Hell, depending on whether or not he trusted Christ as his Saviour. If he's in Heaven, he can certainly move, respond , and walk. And if he's in Hell, he can certainly move, respond, and walk. I won't take the space to quote the many Bible verses concerning the dead, but I suggest you read the story of the rich man in Luke 16 and you will see that though he had died he could still talk and make decisions. And if you'll read Revelation 6:9-11 and Luke 15: 7 and 10, you will see that people who are in Heaven are conscious. You will see that they rejoice. They talk. They know what's happening on earth, and they ask questions of the Lord. So you're wrong when you compare the spiritually dead state of a sinner with that of a body lying in a casket. Further in your letter, you tell of a young girl who was supposedly led wrong by what you call Baptist doctrine. You say she accepted Christ, and now she is living immorally and impure. Now, Mr.___________, I can only say what the Bible says in Hebrews 12:8, "But if ye be without chastisement, whereof all are partakers, then are ye bastards, and not sons." If the young girl you mentioned has trusted Christ as Saviour, I can assure you that she has everlasting life and she will be chastened. John 3:36 says, " He that believeth on the Son hath everlasting life." Now that's a fact. It's not a matter of what I think about it. It's a matter of what the Bible says. And Hebrews 12:8 makes it clear that those who trusted Christ as Saviour will be chastised. On page 5 you say, "Now as to perseverance..." and you call attention to Revelation 3:5 and talk about overcoming. You imply that this overcoming is some kind of perseverance or effort. First John 5:4,5 says, "For whosoever is born of God overcometh the world: and this is the victory that overcometh the world, even our faith. Who is he that overcometh the world, but he that believeth that Jesus is the Son of God?" Here the Bible says plainly that the victory that overcometh the world is our faith. We overcome the world by trusting Christ, not by persevering. I made it plain in my article that I believe in eternal security, but the saints are not secure because they persevere. They are secure because they have been preserved. The word "perseverance" is defined in Webster's Dictionary as "a persistent effort." "Preservation" is defined as "the act of keeping or state of being kept from injury or decay." The victory that overcomes the world is not your perseverance. It is your faith, according to 1 John 5:4. You close your letter with a P.S., "Note no human is born of his own will but of the will of the parents. Christ says we are to be born again." Again, you make the mistake of using a human illustration in order to build a Bible doctrine. You seem to make the same mistake that Nicodemus made in John chapter 3. He tried to compare the spiritual birth to the physical birth. In John 3:4 he said to Christ, " How can a man be born when he is old? can he enter the second time into his mother's womb, and be born?" You cannot compare the physical birth to the spiritual birth. Jesus said in verse 6, "That which is born of the flesh is flesh; and that which is born of the Spirit is spirit." They are two different things. You will be better off if you will build Bible doctrine on what the Bible says rather than on illustrations. I hope this letter helps you to better understand my position. 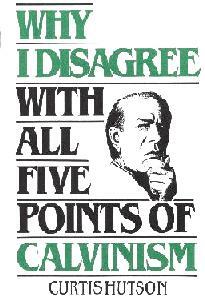 I want you to re-read the sermon, "Why I Disagree With All Five Points of Calvinism," carefully. I'm glad you receive THE SWORD OF THE LORD, and I want you to feel free to express your opinions about anything you find written in the paper. Calvinism lie = They believe, because they were chosen. The truth = We were chosen, because we believe!